The first story arc comes to an explosive and surprising end as Gail Simone and Cat Staggs have taken the familiar body switching storyline and put some delicious though-provoking twists in it. It's been interesting reading Gail Simone's social media posts because she genuinely seems taken aback by the success of 'Crosswind. 'I've rated it high since its debut for the clever plotting and eye-popping art but so has nearly every other comic site. The comic will also be adapted into a television show on Syfy so its success has transcended one medium into another. Being as humble as she is, Simone is grateful for the praise and showers all the kudos on Staggs, letterer Simon Bowland, and production artist Carey Hall. It's a team effort of course and Simone's sizable contribution elevated 'Crosswind' to one of the most imaginative and subversive titles of the year. On the surface, any body-swapping tale is going to teach a lesson to those who find themselves literally in someone else's shoes. They learn to appreciate what that person goes through and develop a sense of empathy that maybe didn't have before. When the swap involves an unappreciated wife and a mob enforcer there are plenty of lessons to learn. There's also a lot of danger. Cruz, his henchmen, and Vox are en route to Juniper's home in Seattle. Cason as Juniper has assimilated very well into a fierce maternal influence over her son and become the "take-no-crap" wife to her cheating condescending husband. The internal transformation for Cason has given him a whole new perspective on life now that he's removed from the sleazy deadly world from whence he came. Now it's about cooking a great dinner, battling her son's bullies and making friends with the neighbors. And kicking that shitbag of a husband to the curb. The switch for Cason has mostly removed a giant weight off his shoulders from being under the thumb of a mob boss and working with psychotic colleagues. One of which is on his way to murder him in his new body and the family he's assumed. For Juniper, it's been a different type of awakening. Once a pushover, disrespected by everyone, a passive wallflower living a miserable unappreciated existence, Juniper as Cason found her inner strength, a strength that had always been there. She was always smart but taking the place of a respected and feared mobster tested her in ways she never had before. She had to make decisions, life and death decisions, quickly and confidently. These were situations that made suburban life seem tame by comparison. Yet, Juniper persevered and found the respect (and some pampering from Cason's girlfriend Mika) that she had deserved for so long. The lesson here was not that they learned something from an outward source, some enlightening event, or a mentor. Not even Vox whose mysterious and mystical power to initiate the body switch in the first place taught them "grace" as he planned as a form of revenge. In fact, the surprisingly underdeveloped character of Vox didn't play a big role in the series. He became a disposable plot device but what Juniper and Cason did learn was the capacity to change from within. Their self-discovery revealed a strength and power that they suppressed in their normal lives. Cason found empathy, suddenly responsible for Juniper's step-son in need of some discipline and confidence-building. He recognized the kindness of others, opening to his neighbors including a transperson who is portrayed as a regular human being. Juniper found her voice, a confidence she had resisted to express before using her smarts as well as her newfound toughness to deal with high-pressure situations. Whatever ailed their respective lives was within them all along. Their new bodies became the vessel, a cocoon, in which they blossomed from. Cat Staggs is a singular talent No one does photo-realistic art like Staggs does and is responsible for the signature look of 'Crosswind.' As adept at action and violence, as she is, Staggs excels at conveying characters' thoughts and emotions through facial expressions and body language. When Staggs is involved there's never a dull moment with briskly paced layouts and bold panels. She's made the series a uniquely visual stunner. 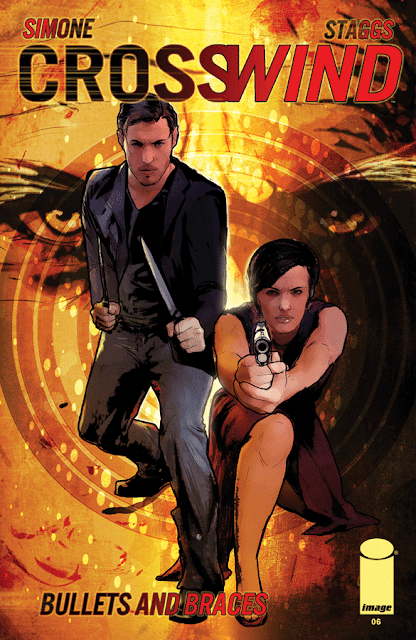 'Crosswind' ends its first arc with a satisfying and unexpected conclusion. It opens up the world to new possibilities with characters that symbolize the magnitude and weight of change and self-love. Simone and Staggs have created a multi-layered crime drama that dabbles in the familiar while provoking emotions and thoughts that will surprise.